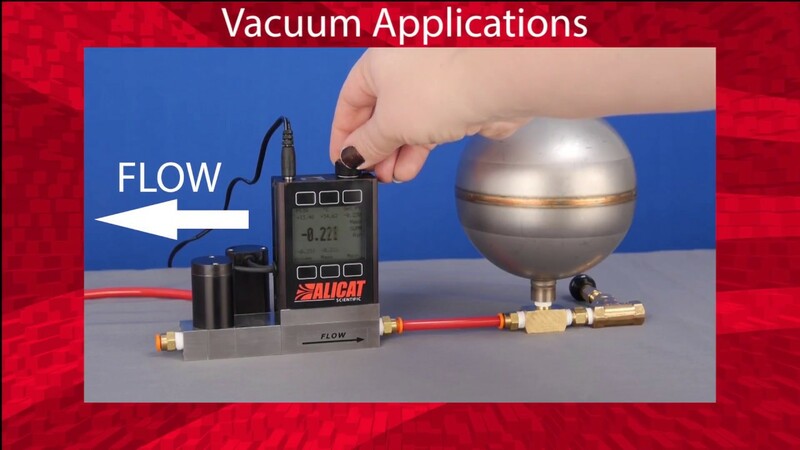 Alicat’s MCD is the world’s first bidirectional mass flow controller. Control flows into your flowing or closed process in one direction, and then reverse flow with multivariate measurement of flow, pressure and temperature in each direction. Or control flow into a closed process using pressure control while monitoring flow rates, and then vent the volume with no need for additional bleed valves. We’ll use your application parameters to customize your valve and PID tuning to ensure that it delivers fast and stable control, in both directions. Versatile. Control flow with positive pressure or vacuum in one or both directions. Or control pressure into flowing or dead-ended processes. (Download our infographic on the right for flow diagrams.) In all cases, flow measurement is multivariate (mass flow, volumetric flow, pressure and temperature), and you can select another gas calibration on the fly or define your own gas composition with COMPOSER™. Durable. MCD series flow controllers can temporarily flow liquids without getting destroyed. For environmental hardiness, we can build your flow controller with IP66 ingress protection. Your mass flow controller may be customized with one of the following valving options to ensure optimal performance under your expected process conditions. Instruments in the standard MCD series are also available with an optional “S” configuration (MCDS) for use with corrosive gases. In this configuration, we upgrade the valves to 303 stainless steel, the sensor to 316L stainless steel and the elastomers to FFKM. Some corrosive gases require 316L stainless steel throughout the flow path, and in this case we can upgrade both the valves (type PCA) and flow body to 316L for full-scale flow ranges of 20 slpm or less. Alicat’s MCD series uses small proportional valves for control at lower flow rates and is suitable for use with non-corrosive gases. Alicat’s MCPD series offers the largest orifice in a small valve format and is suitable for use with non-corrosive gases. Alicat’s MCRD series uses nearly frictionless Rolamite valves and a variety of orifice patterns for control at high flow rates and is suitable for use with non-corrosive gases. Alicat’s MCDS series uses small proportional valves for control at lower flow rates and is suitable for use with corrosive gases. Alicat’s MCRDS series is suitable for use with corrosive gases and uses nearly frictionless Rolamite valves and a variety of orifice patterns for control at high flow rates. Set the MCD to control absolute pressure, and you have a basic leak-check system in a single device. Once the test pressure is achieved, a positive flow rate indicates the presence of a leak. The second valve is used at the start of the test to ensure the target pressure is not overshot, and at the end of the test to release the pressure. The MCD bidirectional flow controller sets a constant mass flow rate against the pressure relief valve as the absolute pressure in the system is recorded. After the relief valve opens, a negative flow setpoint is commanded to reduce the pressure and prepare for another run.